Here the Wales Coast Path passes the landward end of Britain’s longest breakwater, which is 2.4km long. The breakwater is listed. So too is the lighthouse at the far end, as an example of a harbour light which has retained much of its original character. The stone embankment was built out into the sea in three stages, from 1847 to 1873, in response to the growth in shipping at Holyhead. Most of the stone was transported by broad-gauge railway from nearby Holyhead Mountain, where the disused quarries now form the Breakwater Country Park. The structure was dressed with limestone from Moelfre, on Anglesey’s east coast. The completion ceremony in 1873 was performed by the Prince of Wales and Duke of Edinburgh. The press reported that 3,500 ships each year took shelter in the harbour. On the night of 25-26 October 1859, Brunel’s Great Eastern, the biggest ship in the world, sheltered here from the “Royal Charter storm”, so-called because of the shipwreck at Moelfre which cost more than 400 lives. The recently-built Great Eastern was subjected to such powerful forces that its anchor chain was bent around its prow, but the ship survived. The breakwater was badly damaged. The ship is visible on the left in the picture (right) of the breakwater under constrution, from the Illustrated London News. This area of Holyhead is known as Soldier’s Point. Charles Rigby, contractor for the breakwater’s construction, lived in the large castellated house called Soldier’s Point House, built in 1849. 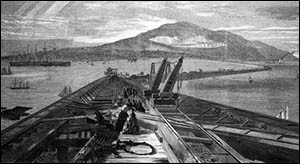 He also worked on some of Brunel’s civil engineering projects. He was an Anglesey magistrate and commanded the 2nd Anglesey Artillery Volunteers. In March 1918 the house’s owner Lieut AF Pearson, chairman of the local magistrates, was charged with hoarding food including rice, jam and sugar. The charges were dropped after he explained that wounded soldiers were treated to tea at the house every Sunday. During the Second World War, part of the building was reinforced to form a defensive “pillbox”, with narrow openings for gunfire. The building was damaged by fire in 2012.